Central air conditioning is the term used when you have an air conditioner or heat pump cooling the air and distributing it throughout the home via installed ductwork. This is also referred to as a split system because it requires two parts: an indoor unit, such as a furnace or air handler, and an outdoor unit such as an air conditioner or heat pump. Indoor and outdoor units are designed to work together so that when properly matched, you get maximum efficiency and longer system life. Air conditioning efficiency is measured using a Seasonal Energy Efficiency Ratio (SEER) which measures the energy used to cool a certain amount of space. A higher SEER means higher energy efficiency. The latest standard for minimum SEER is 13 (beginning January 2006). An air conditioner serves a single purpose: cooling the air inside your home. A heat pump however can cool or heat your home. Both air conditioners and heat pumps use R-410A refrigerant for cooling, but a heat pump provides warm air in the winter as well. 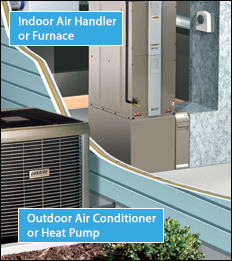 Heat pumps are electric and ideal when a gas fuel source is not available to power a furnace. Heat pumps can also save money in areas where average winter temperatures are 40 degrees and above as a heat pump is often cheaper to run than a gas furnace in such climates (depending on fuel prices). The EPA has reported indoor air quality as a high level concern for modern American homes. New construction seals improve heating and cooling efficiency, but also trap in pollutants like toxins, bacteria and mold to name a few. The answer is to incorporate indoor air quality products into your HVAC system. These work together to a complete indoor comfort solution. Ultraviolet air treatment systems or UV Lamps are designed to prevent mold spore growth on air conditioning coils. This technology, used for decades in water treatment, helps reduce allergic reactions to mold while enhancing overall air quality. These sit inside your system next to the coils themselves. Air cleaners offer an effective way to remove up to 94 percent of the particles - dust, pollens, pet dander, plant spores, fungi, bacteria, tobacco smoke, etc. - from the air that passes through the home. This helps avoid duct cleaning, access dust in the home and units with high MERV ratings catch microscopic organisms. 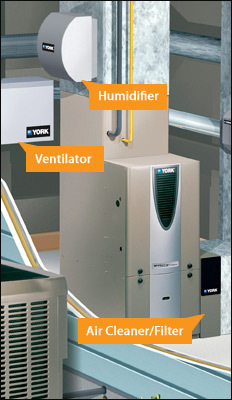 Whole-house humidifiers replenish moisture to indoor air. This is important because dry air absorbs moisture from everything around it, affecting comfort, health and even household items like furniture/woodwork. When the power goes out in the middle of a winter storm, or during a blazing hot summer month, a home standby generator is a valuable thing to have. Not only can one keep your HVAC system running, but allow you to use lights, computers, TV, etc. Standby generators typically run on natural or LP gas and can provide automatic startup / shutdown so that when the power goes out, you don't have to do a thing. 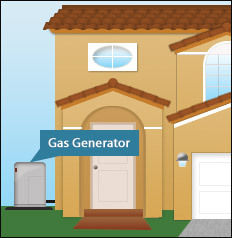 The size of the home generator chosen will dictate how much of your home it can support in the event of a power failure. Regardless of your climate (whether extremely hot or cold), the Earth maintains a nearly constant temperature year round. Similar to a cave, this ground temperature is warmer than the air above in the winter and cooler than the air above in the summer. Like a normal forced air system (split system), a GHP uses ductwork to move the conditioned air through your home. However unlike an air source heat pump which extracts or exhausts heat to or from the outside air, geothermal heat pumps exchange heat with the ground. This is much more efficient as underground temperatures are fairly stable throughout the year. During the summer months, a geothermal heat pump extracts heat from the indoor air, sending this heat down into the earth loop system (vertical loop represented here). The heat is dissipated into the ground, the air is cooled and sent back into the ductwork. In the winter months heat is extracted from the ground and used to heat the air which then of course is sent back into the home. With a GHP, the "heat exchanger" is underground piping referred to as an open or closed loop. Common loop systems include vertical (shown here), horizontal, water-source (lake/pond) and well-water (open loop). The drilling for a geothermal heat pump is the most expensive part with vertical loops being the most expensive and well-water loops typically being the least expensive to install. Your options vary depending on your area, size of land space, etc. According to the National Renewable Energy Laboratory, all areas of the United States have nearly constant shallow-ground temperatures, which are suitable for geothermal heat pumps. Using this efficient, natural, renewable energy source saves our world by paving the way for a better tomorrow and saves you substantial amounts on your utility bills.